With so many attractions and sights to squeeze into your visit to Bangkok, time is of the essence if you want to make the most out of the city, no matter how long you're there for. Cycling around the city on a set tour or by a rental system can unveil hidden gems and treasures. You can peddle away from the tourist tracks and head to more unknown areas and really explore the city and its surrounding quaint country villages. 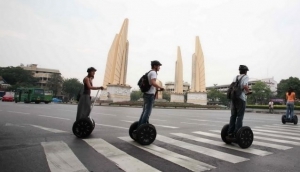 Sticking to set cycling and segway tours can also give you a deeper knowledge and understanding of Bangkok.